9781120249395 | Kessinger Pub Co, September 15, 2009, cover price $46.95 | also contains A Concise Natural History of East and West Florida, A Concise Natural History of East and West Florida | About this edition: This scarce antiquarian book is a facsimile reprint of the original. 9780817308766 | Univ of Alabama Pr, November 1, 1999, cover price $59.95 | About this edition: Braund presents the only annotated edition of Bernard Romans's rare and valuable 18th-century account of his observations in the southeastern United States. 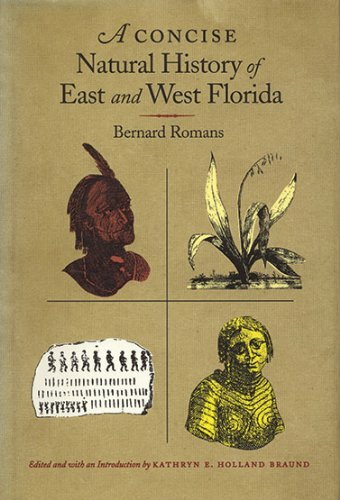 9780817357733 | Reprint edition (Univ of Alabama Pr, April 1, 2014), cover price $39.95 | About this edition: Bernard Romans's A Concise Natural History of East and West Florida, William Bartram's Travels, and James Adair's History of the American Indian are the three most significant accounts of the southeastern United States published during the late 18th century. 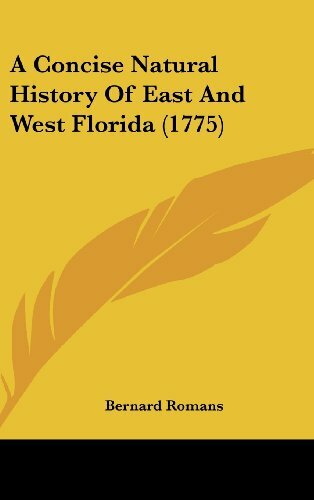 9781120113528 | Kessinger Pub Co, September 15, 2009, cover price $31.95 | also contains A Concise Natural History of East and West Florida, A Concise Natural History of East and West Florida | About this edition: This scarce antiquarian book is a facsimile reprint of the original. 9781565546134 | Firebird Pr, January 1, 1999, cover price $30.00 | About this edition: Covering everything from Acadians to YellowFever, Bernard Romans exhaustively addressed daily life in Florida and minutelydescribed its natural features-but he also did much more.